Ulysse Nardin, the Leader in Timepiece Invention and Innovation, Demonstrates Breakthroughs in Watchmaking with the Freak Diavolo Only Watch. Ulysse Nardin, the Swiss watchmaker acclaimed for its thousands of “firsts” in watchmaking, takes the lead in ingenuity, once again with the new Freak Diavolo Only Watch, a progression of the groundbreaking 2001 Freak. Named after its devilish-in-appearance power-reserve backing, with its “horns” and black cloak-like backdrop, the Freak Diavolo Only Watch is the cleverest of timepiece creations. Case in point, silicium is used in its patented hairspring (Si 1.1.1.) and throughout the majority of its escapement – the heart and most delicate part of the watch. Through the introduction of silicium in the original Freak, Ulysse Nardin transformed haute horology manufacturing and continues to perfect the use of this technologically advanced material with the Freak Diavolo. Performance is further amplified through its application of cutting-edge technology, such as photolithography. And, the Freak Diavolo Only Watch reveals another development in the Freak family  a flying tourbillon that indicates the seconds, as well as two new ball-bearing systems and a balance-wheel concept and design. 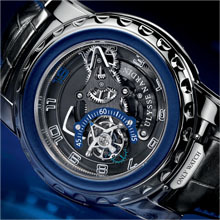 Its tourbillon carrousel (developed entirely in-house) does one complete rotation around the center in 60 minutes. The Freak Diavolo’s frequenc y of 4 Hz (28'800 A/h) in association with its 8 mg*cm2 inertia balance wheel make this instrument exceptional, as no other tourbillon is regulated by such a powerful oscillator and benefits from such a long power reserve (more than eight days). Its outstanding performance is the result of the perfect application of new technologies, such as photolithography, and the use of the best and latest-developed materials, like silicium and LIGA nickel, at core locations. 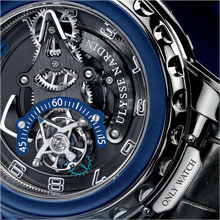 Ulysse Nardin’s expertise in watchmaking is further exemplified by the Freak Diavolo’s seconds indicator, which is nothing else than a flying tourbillon replacing the usual oscillator of the other members of the Freak family. Its cage is equipped with an arrow indicating the seconds on a blue half-circle, rotating in one minute on itself, with the zero position holding steady on the axis of the minute indicator. Not only brilliant in function, the Freak Diavolo Only Watch is also stunning in aesthetic with its clean lines, robust black and charcoal tones, accents of vibrant color, a stainless steel case and elegant crocodile strap. The Freak Diavolo Only Watch is the ultimate symbol of unwavering imagination and unusual style, staying true to the inventive character that defines the Freak timepiece collection. Moment of inertia: 8 mg*cm2, adjusting over 4 screws. 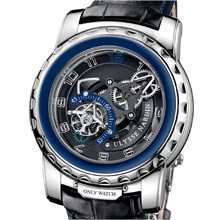 Hairspring: Silicium, exclusive Ulysse Nardin design. Escapement: right-angle lever, silicium, non lubricated. Tourbillon: 1 revolution in 1minute. Orbite: 1 revolution in one hour. Winding: Manual winding over the bezel on the back of the case. 1 full rotation is equivalent to 12 hours of power reserve. Time setting: forward and backward over the bezel.